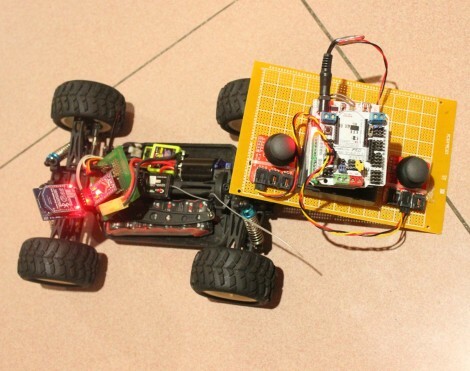 This radio controlled car controller replacement is a great project to try some new things with that fancy hardware you’ve got sitting around. The hack comes in two parts, the receiver and the transmitter. They’re communicating via Bluetooth so if you only want to build one side of the hardware you should be able to make most Bluetooth devices work as the other. For instance, build the receiver for the car and control it with a Wii remote. Or use the controller to play emulator games on an Android phone. Both pieces are Arduino based. The controller makes use of a Freeduino with a Bluetooth shield as well as a pair of analog stick breakout boards. The car side of things uses a Bluetooth Bee (a Bluetooth module that is pin compatible with an Xbee socket) and an Arduino pro. Once the hardware bits are assembled, it takes very little code to get the system up and running. Join us after the break for a quick clip of the car in action. Is it just me, or does it look to have quite a bit of latency between him hitting the control sticks and the car reacting? Sweet, cool project! I’m glad to see others pushing the DIY limits of present wireless technologies. it’s probably a bit laggy because he’s using 300ms delays in the controller code. Could do it via interrupts instead, then just poll each analog pin when the interrupt fires and update everything accordingly.